Big thanks to Ross at Ping Identity for organizing and Jamf for sponsoring the Mac Admin meetup on September 9, 2015. We filled the tiny meeting room and we will have to expand to the larger conference room (or theatre) next time. It was a well attended meetup with much discussion of the earlier day’s Apple announcements, new OS X “El Capitan” and iOS 9 changes and how this affects management products like Casper which have had to move the binary because of the new SIP implementation in OS X.
I opened up the meet up with a presentation on Storage, SANs and the new Accusys Thunderbolt SAN A16T2-Share product. The goal of my presentation was to give a quick overview of SAN technology as I’ve seen it change over the last 10 years: from Fibre Channel, to iSCSI to PCIe and Thunderbolt based. The last change to Thunderbolt based SANs is the most interesting for small video production workgroups or anyone that likes working on small scale shared projects but needs a decent bandwidth at an affordable price. Block level storage (SANs) is straight forward storage tech for users and applications to interact with without having to negotiate network protocols (AFP, SMB, or NFS). It’s never been quite that affordable until now. Having built a lot of Fibre Channel based SANs for media and entertainment companies and post-production editors in corporate environments I know how awesome and fast and solid these SANs are. Lots of editors and clients can hit a large SAN and it won’t blink. Thirty or Sixty users is not unusual. But not everyone believes in fibre channel or the idea of pulling fibre cables. It is surprisingly a large stumbling block to building large SANs, “no, we don’t want fiber cables”. True, sometimes clients have objected to gigabit Ethernet too, but that’s another story. I found that iSCSI, especially with the DDP units I’ve set up, has been a great alternative to fibre channel. Not fiber cables to pull. Just use the CAT6 cables already in place. Great Ethernet based SANs using 1 x or 2 x CAT6 cables per client, or even 10G. Works well. Very well indeed. It’s been great for smaller (and larger) clients who want a great Ethernet iSCSI SAN solution without needing fibre channel cables, switches, HBAs, Thunderbolt adapters, etc. 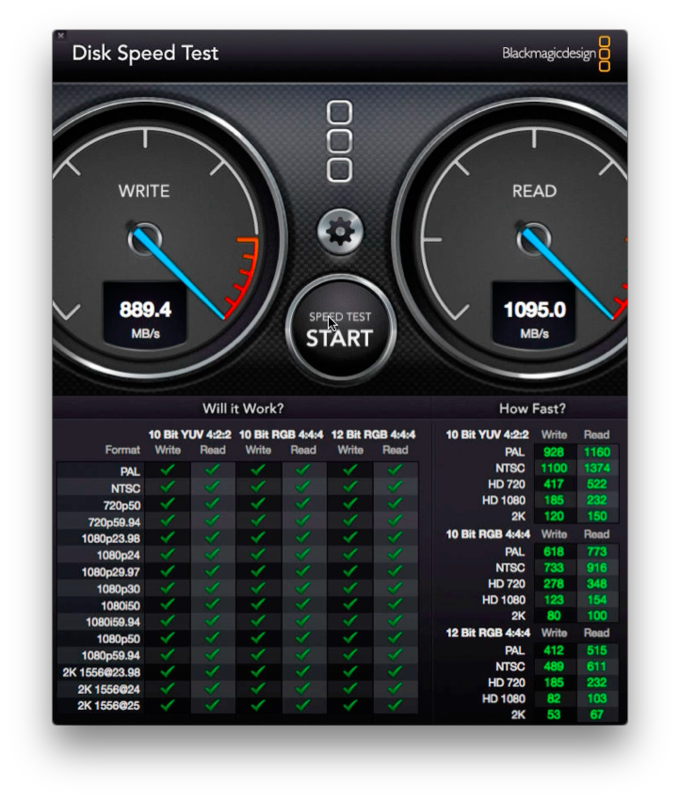 That’s why when I stumbled across the Accusys Thunderbolt storage I was kinda really excited. No fibre channel to Thunderbolt adapters. Just use Thunderbolt cables. Brilliant! Finally a solution for small workgroups. And there’s so many video groups sprouting out of every corporate office, or boutique VFX or post-production shops that have been struggling with small NAS solutions that were not meant for video production. Now you can get that SAN that you’ve wanted, you can really get that block-level storage at an affordable price. Instead of working locally and copying raw footage and finished products back and forth across slow network links they can work in a small video group with high speed storage. Sa-weet. (Can you tell I’m excited?). I’ll include the presentation PDF here as a link if anyone is interested. 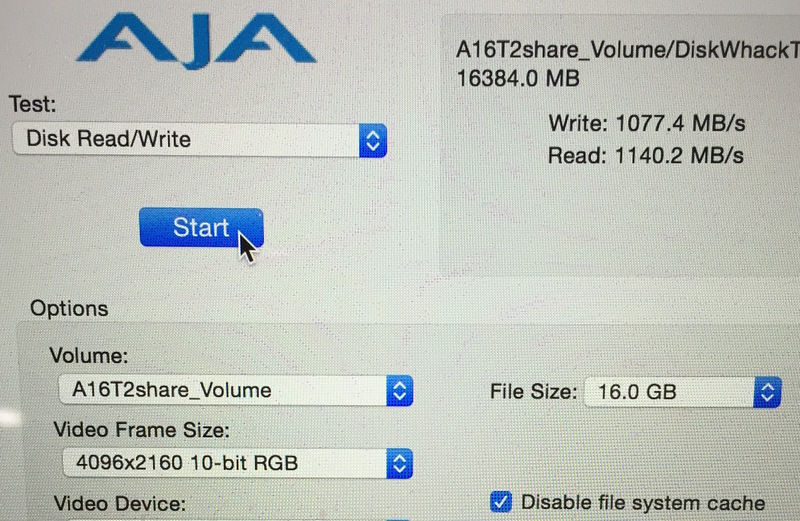 I’ve added a link at the end from Accusys on how to build an Xsan with the A16T2-Share. Yes, Xsan from Apple still exists and is bundled with the OS for free. Building a SAN is pretty easy and everyone can do it. Don’t forget your backups though. Lastly, anyone interested in attending any meetings for the upcoming MacDevOps:YVR (June 16-17, 2016) drop me a note. I added the email in the presentation document. I’ve mentioned the Accusys A16T2-Share Thunderbolt SAN storage before. I first encountered it at NAB 2015 back in April. It was truly a magical find. A 16-drive RAID unit with 64TB raw storage and ready to be part of your Apple Xsan using Thunderbolt connectors. 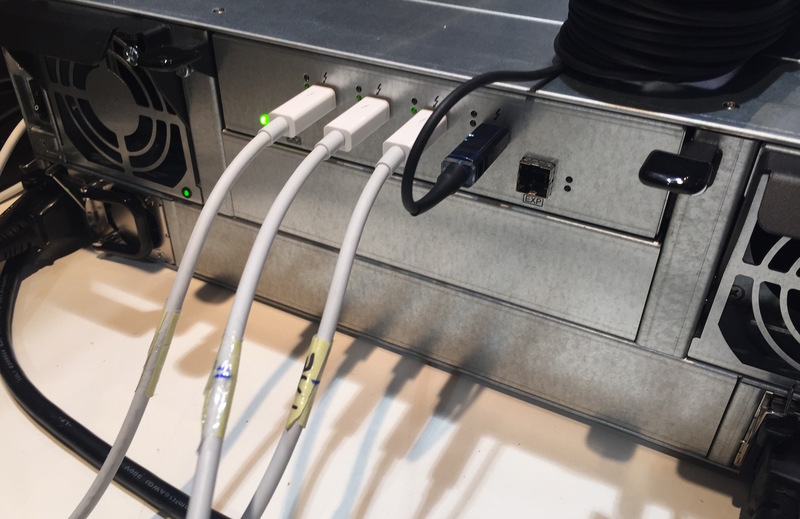 No Thunderbolt to fibre channel adapters necessary, nor is a fibre channel switch required. Just plugin a Mac Mini as your Xsan controller, and there’s room for 3 other clients to plugin with Thunderbolt. Pretty neat. It’s not for everyone. There’s a limit to the length of Thunderbolt optical cables. And there’s only 3 clients possible using one last Thunderbolt connection for an Xsan controller. But this could work well for small work groups. The magical 4-seat SAN setup is finally here. Bob Kite, master SAN builder, would be happy. I’ve just gotten word that this unit is available for sale now, as it was recently certified by both Apple and Intel. I believe the street price is approximately $9900 USD, but don’t quote me on that. Information is still emerging on this new product. I do hope to get my hands on one to do some real world application testing. Including testing resilience to failure (drive removals, raid rebuilds, etc). If the reliability of the Accusys hardware is good, and backed up with solid support then this could be a great product. Of course, it kinda goes without saying that all storage, including Shared SAN storage, needs solid backups. My preference where possible is a second tier disk (NAS/SAN/DAS) and tape. My preferred vendor is Archiware which makes the very excellent product P5. With over 10 years of experience with Xsan and setting up storage systems I have learned to always setup excellent backups. Restoring files when a RAID or SAN fails is crucial. Using an a RAID, such as the Accusys Thunderbolt A16T2-Share, as a SAN would be come with a recommendation from me to all my clients to have a secondary Thunderbolt RAID unit of the same size to sync it daily and to use P5 Backup with LTO 6 tape drives (preferably in a tape library). You never can be too paranoid with a client’s data. That’s what my clients pay me for. To plan for failure. I love setting them with excellent SAN storage, but I must counsel them to build also an excellent backups system. Better safe than sorry. The price point on this A16T2-Share Thunderbolt RAID is attractive, and when it is released many clients in small shops may very well consider it. 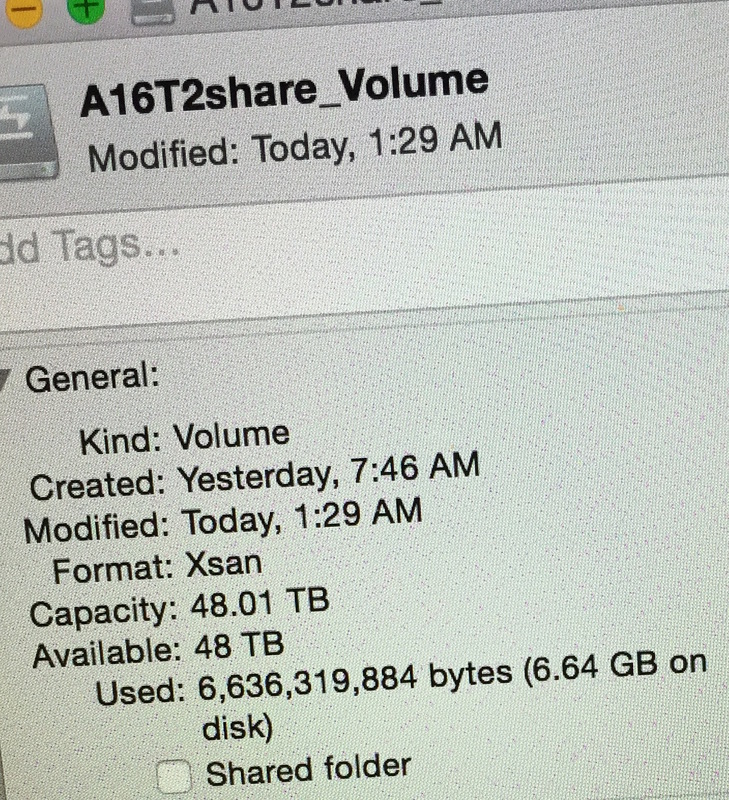 At approximately $10K US for 64TB of shared storage with free Xsan 4 it is a pretty sweet deal. Add another $5-10K for a large backup RAID drive, and another $5K for a tape library and $2K for Archiware P5 Backup and the cost adds up. But having an affordable price for the main SAN storage makes this a very real possibility for some clients who have been struggling with editing video on NAS like QNAP, Synology or Drobo.